a molecule that transfers energy. A7uses sunE7light (A7see how algae uses, E7uses sunAlight). The Calvin cycle uses light energy to consume carbon-dioxide and water; it emits oxygen as a byproduct and produces sugar that living cells can use. 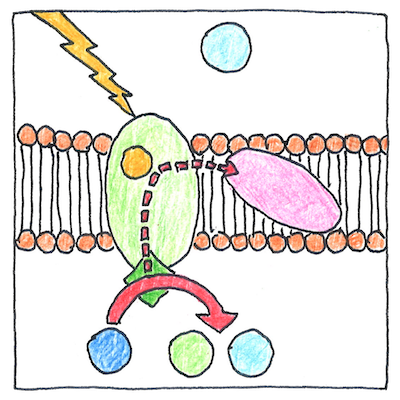 Cells that use ATP as an energy source convert it back into its precursors so that it is continuously recycled. Mitochondria in a human cell produces ATP in the citric-acid cycle discovered by Hans Adolf Krebs.